I love Adventure Time. If you somehow haven't given a chance to one of the most cleverly written and surprisingly sentimental cartoons of the last decade, you owe it to yourself to give it a look. Beneath the show's deceptive, saccharine exterior is a rich tapestry of coming-of-age stories set against a surprisingly grim post-apocalyptic landscape. Today's Pop Creature entry comes courtesy of one such post-apocalyptic element that is something I've wanted to recreate in Pathfinder for a while: the goo monster. 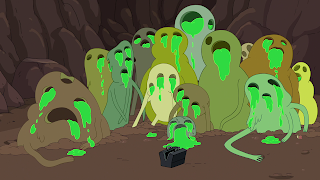 First seen in the tragic and amazing episode, "Simon and Marcy," the goo monsters are horrible radioactive nightmares that evoke zombie-like reactions. The first time I saw these critters I thought about the blightburn sickness from Paizo's Kobolds of Golarion. The fusion of shambling zombies and radioactive nightmares seemed like something perfect for a Pathfinder game. Below, I've adapted the goo monsters from Adventure Time as the dreadful blightburn zombies! Hopefully these horrifying creatures find their way into your own Pathfinder games. This shambling corpse with pallid, molten flesh radiates a faint greenish glow. From its eyes and mouth a corrosive sludge drools forth, some even erupting from fissures in its skull. A blightburn zombie is a variant of the zombie template, arising in areas of magical or technological radiation such and the Darklands, Mana Wastes, and Numeria. The Blightburn zombie template uses the rules for the zombie template from Bestiary 1, except as detailed below. The DC of a blightburn zombie's special abilities is 10 + 1/2 blightburn zombie HD + Cha modifier. Blightburn Touch (Ex) Any creature that is damaged by a blightburn zombie's slam attack or takes damage from their corrosive vomit ability must make a Fortitude save or contract blightburn sickness. Corrosive Vomit (Ex) As a standard action a blightburn zombie may emit a 10 foot cone of corrosive, radioactive fluids. This attack deals 1d6 points of acid damage per 2 HD the blightburn zombie possesses. A successful Reflex save halves this damage. Create Spawn (Su) A creature that dies of blightburn sickness rises as a blightburn zombie 24 hours later. Radioactive Aura (Ex) A blightburn zombie emits harmful radiation around its body. Creatures within 30 feet of a blightburn zombie must succeed at a Fortitude save or be sickened for 1 round per HD of the blightburn zombie. A creature that successfully saves against this ability is immune to its effects for 24 hours. Immunities: A blightburn zombie gains acid immunity. Open Content: The game mechanics of this game product are Open Game Content, as defined in the Open Gaming Licenseversion 1.0a Section 1(d).